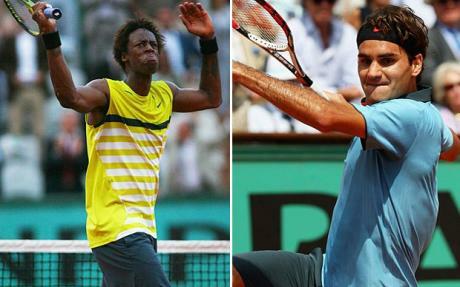 Roger Federer didn’t have too much trouble in the French Open Quarter Final, beating the last French player left in the tournament, Gael Monfils, in straight sets – 7:6 (8-6 tiebreak), 6:2, 6:4. Monfils, the great French hope to win the Roland Garros (France hasn’t had a men’s Champion since 1983, Yannick Noah) put up a fight in the first set, but after the second one seemed to lose interest in games he wasn’t serving. The crowd’s support withered as Monfils chances and apparent effort withered as well. Federer didn’t play a perfect game, far from it, but never dropped a serving game and just outplayed Monfils too many times. The Swiss was never intimidated by Monfils and the home support and after coming back from 6-5 down in the tie break and winning the first set it seemed he knew he was going to win it. Monfils, like in all his encounters with Roger was too much on the defensive and as the game progresses starts relying more on his instincts and athleticism than actually thinking how to beat Federer. It produces some great shots and aces, but in the long run it loses games. Federer progresses to his 20th straight Grand Slam Semi Final and awaits Robredo or Del Potro in the Semi’s. With Rafael Nadal out of the way it seems like it’s anybody’s tournament to win, but I’m sure Federer is growing in confidence that this maybe the year he completes his own personal Grand Slam.